If you keep your Mongolian on cedar or pine bedding, it could develop nasal dermatitis, or a sore nose, since gerbils are sensitive to the aromatic oils in pine and cedar shavings. Equally, repeated chewing at cage bars can also act as an irritant, and rub fur off the nose. The nose will look red and sore, and a reddish mucus can make it look as though it is bleeding. Switch your pet to a paper-based bedding, and consider using a box or tank rather than a cage. If problems persist, your vet may prescribe a course of antibiotics. Cedar and pine shavings can also be behind respiratory infections, although viruses and bacteria can cause this too, and stress is a contributory factor. If your Mongolian has a respiratory infection, its coat will look rumpled, behavior will be lethargic, and you’ll hear labored breathing. A course of antibiotics should clear the infection, but see your veterinarian quickly. It’s essential to keep your gerbil’s home at the correct temperature. Direct sunlight and soaring temperatures can lead to heat stroke, while exposure to cold can cause hypothermia. Keep the temperature above 10?C at all times. At the height of summer, a fan can help, or pop a large rock or tile in the freezer then in your pet’s home, so it can cool off by lying on it. Especially if your pet is elderly, overgrown teeth can cause rapid weight loss as the animal can’t eat normally. Be sure to check teeth frequently and ensure your animal has enough gnawing material. Your vet can easily trim your pet’s teeth using specialist tools. 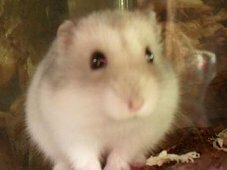 Very young, just-weaned gerbils can be affected by diarrhea . Consider isolating the affected pet to prevent infection spreading, and hold off the fruit and vegetables – too much ‘wet’ food can cause diarrhea. Since diarrhea can be a symptom of a bacterial or viral infection, talk to your veterinarian if the problem doesn’t clear up quickly. Just like most other mammals, gerbils can catch parasites including mites, blood lice and ringworm. Powders, lotions or sprays are available from your pet store, or see your veterinarian. 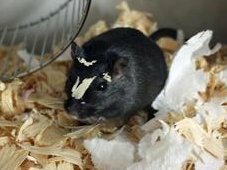 Clean your Mongolian gerbil’s home and contents with hot water and bleach after an infection, and ongoing cleanliness will help prevent infestation. Around a fifth of all Mongolians, especially younger animals, have seizures, ranging from mild to violent convulsions. Stress triggers these fits, as can a new home or excessive handling. There’s also a possible genetic predisposition. Generally, this problem is harmless and temporary. Seizures last no more than a few minutes at most, and Mongolians usually grow out of them. If it happens, just put the gerbil back into its home and keep your pet in a darkened, quiet environment. If there is excess bleeding in the brain, or tissue becomes starved of oxygen, your pet may have a stroke. This is more likely among older gerbils. Your pet will become weak or paralyzed, usually down one side. Keep it warm and comfortable, and make sure it can eat and drink. While your pet may not survive a series of recurring strokes, it could well make a full recovery.